We know that moisture in your system can harm equipment and ruin product or processes. Choosing a method of drying relies on dew point and technology requirements. Please contact Fluid Technology for help choosing the correct dryer for your application. Refrigerated air dryers cool compressed air in a circuit system. The compressed heated air from your process enters the circuit, being pre-cooled by the air leaving the circuit. It then enters an air-to refrigerant heat exchanger where the air is cooled to 38°. This cooling causes the moisture to condense and is drained away. The outgoing air then enters an air-to-air heat exchanger, raising the temperature to keep your piping from sweating. Desiccant Dryers, also called regenerative dryers, twin tower dryers or adsorption dryers, cool air by passing through a pressure vessel with an adsorbent media (activated alumina, silica gel, molecular sieve and others). This type of cooling brings the dewpoint down to -40° or below. When two desiccant cylinders are used, one cylinder is drying the air while the other regenerates. This operation is typically done via solenoid operated valves. Heatless “pressure-swing” drying which uses part of the dry compressed air coming from the other vessel to dry the desiccant in the vessel being generated at lower pressure. Heated dryer, this can use a hot air blower, so there is no loss of compressed air. Heat of compression, which can only be used with an oil-free compressor. Membrane dryers are unique in that they lower both the dew point and the relative humidity at the same time. Membrane dryers consist of staged filtration systems that progressively clean liquids and other contaminates from your compressed air. Like the desiccant air dryers, these dryers create a dewpoint as low as -40°. These dryers can create very clean, very dry air with relative humidity in the single digits. Champion offers a wide selection of energy efficient refrigerated compressed air dryers. These refrigerated air dryers are engineered to benefit you in all of your refrigerated air dryer applications. Champion desiccant air dryers offer customized performance opportunities. From heatless to blower purge, Champion’s desiccant air dryers will meet all of your needs. Champion point-of-use design features of the CMD Series membrane dryer makes it an attractive dryer option when critical applications such as power-coat painting or laboratory insturments are present. The CMD Series provides a reliable method to remove moisture as a water vapor while coalescing filters remove solid particles, liquid water droplets, liquid oil and oil vapors from the compressed air system. CompAir’s refrigerated air dryers lead the way in providing exceptional value to their customers. The flexibility engineered into every CompAir refrigerated air dryer allows you to satisfy your air quality requirements with a single package. CompAir refrigerated air dryers provide dew points up to 38°F. Our refrigerated product lines include proven, high quality components, superior dew point performance, built-in air filtration unmatched in the industry, and savings through energy efficient designs. 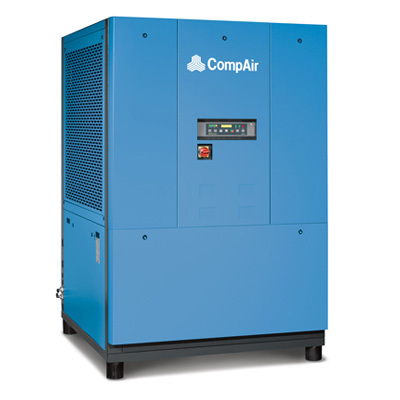 CompAir specializes in delivering the best compressed air quality to your working environment. Removing water, solid particulates and oil from compressed air has many benefits which all lead to increased productivity and reduced overhead costs. CompAir’s desiccant air dryers incorporate the high level of quality and performance you’ve come to expect with the CompAir brand. Low dew point applications (up to -100F) that fall below the dew point of a refrigerated dryer. Applications where air comes in direct or indirect contact with the product. CompAir’s membrane air dryers offer a point-of-use alternative for low dew point applications (-40°F) by using membrane drying technology. CompAir’s competitive membrane dryers feature installation convenience, energy efficient space saving designs and rugged housings. Choose a CompAir membrane dryer for every critical application. Applications ideal for membrane dryers include painting, instrument air, air logic, train doors, air transport, dental and fluid agitation. Hydrovane offers a wide selection of energy efficient refrigerated compressed air dryers. These refrigerated air dryers are engineered to benefit you in all of your air dryer applications. Hydrovane’s desiccant air dryers offer customizable performance opportunities. From heatless to blower purge, Hydrovane’s desiccant dryers will meet all of your needs. Hydrovane offers a unique, point of use alternative in applications where -40°F is required. Equipped with energy savings options, Hydrovane membrane air dryers are sure to keep your compressed air clean and dry, and save you money.